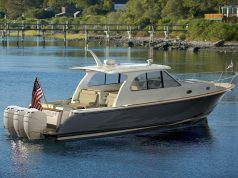 Hatteras has created a fun, easy to operate, great handling boat with the 45 EX. Hatteras’ new entry-level launch injects the brand with new life—and new possibilities. 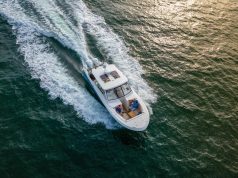 Let me be honest right from the start—I sea trialed the new Hatteras 45 Express Cruiser (45 EX) soon after it was launched, and I was also fortunate enough to view it from another boat as she ran at speed in the ocean. I studied the layout of the helm and cockpit, and, of course, I put my paws all over the interior—opened doors and drawers, and peered into nooks and crannies. My verdict? 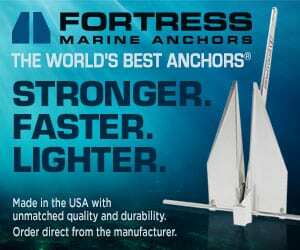 Hatteras has created a fun, easy to operate, great handling boat with the 45 EX. Cruise with the family, drop a fishing line with the guys or gals, or just lie at anchor with your favorite book/movie/sunset view (you fill in the blank)—the 45 EX delivers and adapts. The large cockpit, for example, is a great place for the kids to play, accommodates a few lounge chairs for sunning, or suitably fits cocktail party guests with foldout side bench seating topped with padded coaming. Mezzanine seating adds a vantage point for watching the kids play in the water or spotting the next fish on. With armrests and cup holders, you may never move. The built-in transom baitwell keeps the live ones swimming. Use it, instead, as a cooler filled with ice and bevvies or let the kids use it to store their day’s treasures—thanks to the well’s window they’ll have a field day watching the crabs or snappers they caught meandering about. Under the hardtop, the helm deck’s forward and side windows become part of the structure, with clear panels closing off the aft opening. Side vent windows and an overhead hatch let the breeze in, or opt for climate control with your air conditioning or heating system and boat all year round. Hatteras designed the 45 EX with optimum visibility, which includes the single pane forward windshield. That’s right, it’s one piece of glass—a panoramic view with no mullions to get in the way—a much preferable setup to split windows. Expect the crowd to hang here, as there’s a large L-shaped settee along the aft side and to port, and has a lounger backrest. As witnessed by my portly frame taking a load off, the cushions are well padded and a very comfortable spot from which to enjoy a meal or cocktails on the double-posted table. A molded-in cabinet on the starboard side serves multiple functions. The forward end has a helm companion seat mounted on top—a high perch to see it all—while in the cabinet below is a fridge and freezer and air conditioning/heat vent. Further aft is a flip-up cover where the electric grill is located. 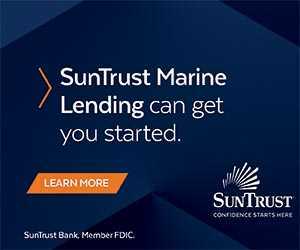 Standing at the elevated helm, there’s perfect vision fore and aft courtesy of the downslope of the forward deck and minimal bow rise during acceleration. Functionally, Hatteras worked the console and dash where they are not overbearing in size. With a pod-style helm, destroyer steering and Palm Beach single-lever shift controls, there’s room forward for the bank of switches to be housed in a plate, with names etched into the metal. CAT engine displays are installed here for easy viewing. Twin Garmin plotter/radar displays are mounted in the console, one directly in front and the other off to the left. Stereo, VHF, autopilot, and engine sync are mounted off to the left but easily within arm’s reach. It’s easy to see the demographics that Hatteras is targeting with the 45 EX—an entry-level boat for newbies, couples and families inclusive, or doubles as a tender for large yachts. It also keeps Hatteras lovers in the brand as they downsize from larger sportfishers and motoryachts. 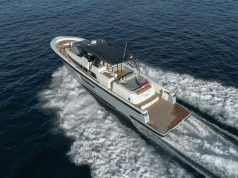 The 45 EX is based on the former CABO 44 EX—a brand owned by Hatteras—and was produced side-by-side with the Hatteras yachts at their facility in New Bern, North Carolina. When the CABO line ceased production, Hatteras pulled the molds over and “Hatterized” the 44 EX by enhancing the model and injecting it with the Hatteras level of quality and support. 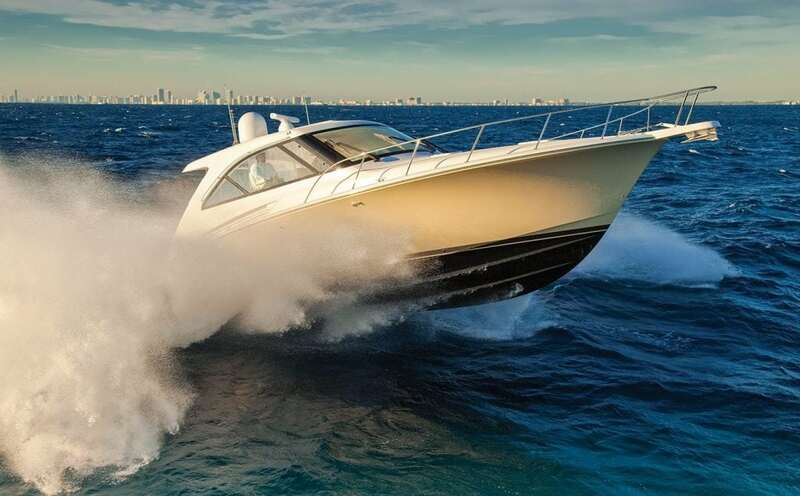 The 45 EX is powered by CAT C18s—good-sized engines sporting 1,150 horsepower each, which easily handled the chop as we took off from Port Everglades, Florida, for the high seas. (Offshore they were only really about two-footers). A burn rate of about 50 gallons an hour (combined total) at 1,500 RPM produced over 22 knots, but when we pushed the throttles up to 2100 RPM the 45 EX zoomed up to 37.5 knots drinking 95 gallons per hour. It’s good to know that if you need a little more go, there’s more to get. We pushed her to wide open and a speed of 40.7 knots. It’s an exhilaration that gets the blood flowing but with the confidence that the resin-infused solid fiberglass hull knows how to handle the rush. Back at the dock I checked out the engine room and although the access size of the entrance was fine—via a floor hatch just behind the helm seat—it was a bit cumbersome getting in and out around the seat. Thanks in part to owner feedback, I’m told they will be changing the location of the entrance, likely through the cockpit mezzanine. Suitable for a day trip, weekend getaway or extended cruise, the 45 EX has full amenities below deck for comfortable living. Galley features include wood flooring, four Jenn-Air fridge/freezer drawers, Kenyon two-burner cooktop, KitchenAid microwave, Blanco sink and faucet, and quartz countertops. There’s storage under the dinette seating, and a large wood table. Forward is a stateroom with center berth, private head access and 32″ TV. An optional second stateroom can be fitted at the forward area of the dinette. To entice the fishermen to this model, Hatteras has made the 45 Express Sportfish fitted with tuna tower, outriggers, cockpit fighting chair or leaning post, tackle center, and fish boxes. Built on the same hull configuration and engine packages, it will deliver the same results while maintaining the Hatteras quality.